Undergraduate competition teases out competitive and creative abilities of budding engineers. Teamwork, competitiveness and creativity characterised City's 2014 Wind Turbine Design Challenge which took place from the 21st to the 24th January. 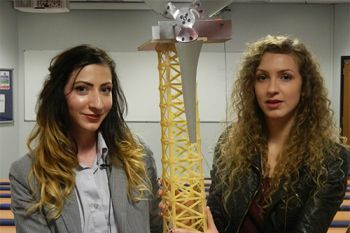 Supported by engineering consultancy Mott McDonald, the competition was set up for tutor groups and teams of undergraduate mechanical engineering students to design, construct and test a small wind turbine made of pasta, plastic pipe and kit of parts for lifting a 2kg weight. 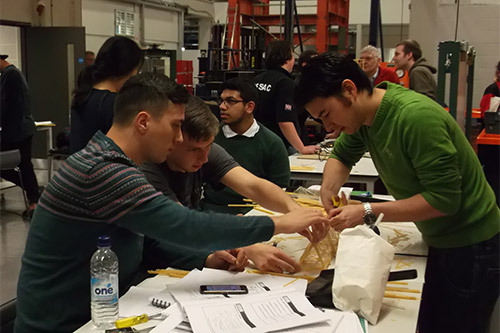 Each tutor group was sub-divided into three teams, responsible, in turn, for Team Alpha (3D twisted turbine rotor blades); Team Beta (Compound gearbox transmission); and Team Gamma (Tower using uncooked spaghetti). Turbines were ranked for efficiency after testing in the Handley Page industrial wind tunnel; towers by overload testing; and gearboxes by electronically timed weight lifts. Staged in the newly refurbished Tait Building's engineering labs and in the Geary Lecture Theatre, the overall group winners this year were: Adam D'Ippolito, Jacky Truong, Osama Eldin Sayed, Alexandra Rogers, Florina Minzat, Maroy Doria, Monchai Luangtana-Ana, Daniel Etieno-Abasi and Mahmood Choudhury. Organised by Professor of Energy Systems (and joint head of the Energy Systems and Engines Group), Professor Keith Pullen and Lecturer in Mechanical Engineering, Dr You Yan, the Challenge also provided a test of time management and communication skills, exposing students to a few of the everyday technical issues and scenarios faced by engineering professionals. "The standard of this year's Wind Tunnel Design Challenge was very high. We accomplished the objectives that we set out to achieve in giving the students an environment in which to experience a flavour of 'real world' engineering. We hope that our students will be better prepared for the exciting possibilities that await them as engineers after completing their degrees." During the awards presentation ceremony on 24th January, Mott McDonald engineers, Johanna Trujillo and Caedmon Shayer, gave a brief presentation on recent wind energy projects undertaken by their company. They also complimented the students on the high level of engineering talent on show during the Challenge.